We are proud to announce, J. Paul Holcomb was a featured poet at the 21st Annual Austin International Poetry Festival (AIPF) April 11-14, 2013. 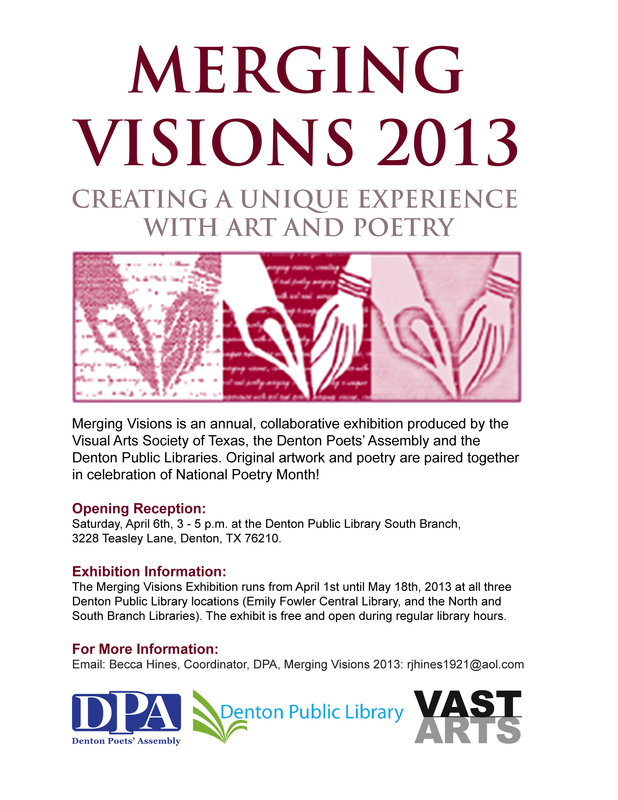 On April 1st , DPA and the Visual Arts Society of Texas kicked off the Merging Visions Exhibition of art and paired poetry at each of the three Denton Public libraries (Emily Fowler, North and South Branches.) The opening reception was held on Saturday, April 6th, 3-5p.m. at the Denton Public Library South Branch. Poets and Artists received their copies of the Collections III book/catalog. The publication features a compilation of the works on display at the Denton Public Libraries.